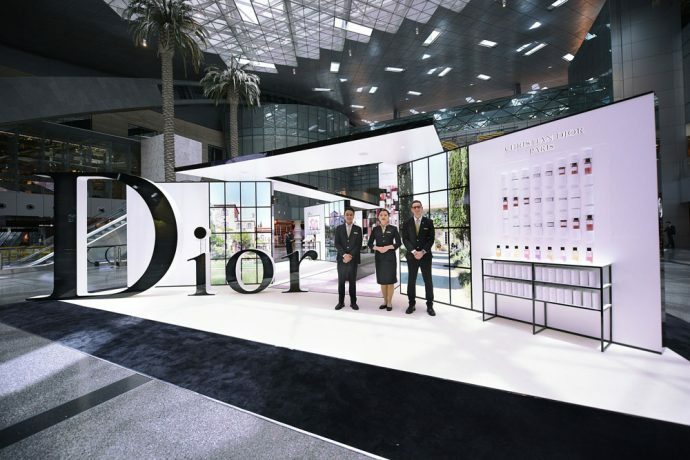 Qatar Duty Free (QDF) has brought the South of France to Hamad International Airport (HIA) by unveiling the new ‘Maison de Parfum’ Pavilion by Dior, featuring the private perfume collection. Passengers departing, arriving or transiting through HIA will be transported to the Dior perfume laboratory in Grasse, France, where they will discover the origins of Parfum Christian Dior’s craftsmanship. The brand’s full fragrance catalogue will be on display, with specific focus on male and female fragrance best-sellers, including Sauvage, Dior Homme, Miss Dior and J’adore. This is the third consecutive year that QDF has collaborated with Parfums Christian Dior to create a unique and luxurious experience for passengers travelling through HIA. For the last two years the Dior Pavilion has received amazing feedback from customers. In 2015, the pavilion featured a “Bed of Roses” installation displaying six thousand hand-planted flowers; last year it featured a 180-square metre animated Dior Les Parfums installation inspired by the ‘Rose de Mai’. QDF is a leading duty free operator in the Middle East, offering its customers an extensive range of leading international luxury brands catering to discerning passengers’ desires, including Moncler, Bally, Burberry, Coach, Hermès, Hugo Boss, Rolex, Bulgari, and Harrods. To learn more about QDF’s new services or to explore its premium range of offerings please visit www.qatardutyfree.com.